1. An 81-year-old diabetic woman with a history of atrial fibrillation is brought to your Urgent Care clinic . She is complaining of abdominal pain, having already vomited once. Her vital signs in the ED are temperature 37.3oC, blood pressure (BP) 105/75 mm Hg, heart rate (HR) 95 beats per minute, and respiratory rate (RR) 18 breaths per minute. You examine the patient and focus on her abdomen. Considering that the patient has not stopped moaning in pain since arriving to the ED, you are surprised to find that her abdomen is soft on palpation. You decide to order an abdominal X Ray. 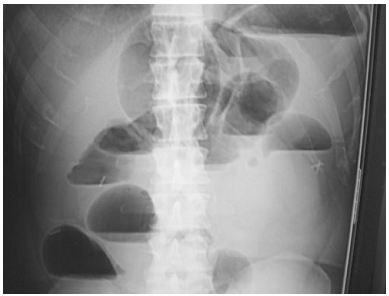 Which of the findings on plain abdominal film is strongly suggestive of mesenteric infarction? 2. A 78-year-old woman is brought to your clinic complaining of vomiting and abdominal pain that began during the night. Her initial BP is 90/50 mm Hg, PR is 110 beats per minute, temperature is 37.8oC, and RR is 18 breaths per minute. After giving her a 500 mL bolus of NS, her BP is 115/70 mm Hg. During the examination, you notice that her face and chest appear jaundiced. Her lungs are clear to auscultation and you do not appreciate a murmur on cardiac examination. She winces when you palpate her RUQ. An ultrasound reveals dilation of the common bile duct and stones in the gallbladder. What is the most likely diagnosis? 3. A 71-year-old obese man is brought to the clinic complaining of constant left mid quadrant abdominal pain with radiation into his back. His past medical history is significant for hypertension, peripheral vascular disease, peptic ulcer disease, kidney stones, and gallstones. He smokes a pack of cigarettes and consumes a pint of vodka daily. His BP is 145/80 mm Hg, PR is 90 beats per minute, temperature is normal, and RR is 16 breaths per minute. Abdominal examination is unremarkable. An ECG is read as sinus rhythm with an HR of 88 beats per minute. An abdominal radiograph reveals normal loops of bowel. Which of the following is the most likely diagnosis? 4. A 51-year-old man describes 1 week of gradually worsening scrotal pain and dysuria. He is sexually active with his wife. His temperature is 37.8 oC, PR 81 beats per minute, BP 140/75 mm Hg, and oxygen saturation is 99% on room air. On physical examination, his scrotal skin is warm and erythematous. A cremasteric reflex is present. The posterior left testicle is swollen and tender to touch. Colour Doppler ultrasonography demonstrates increased testicular blood flow. Urinalysis is positive for leucocytes. What is the most likely diagnosis? 5. A 73-year-old man is seen at your clinic for abdominal pain, nausea, and vomiting. His symptoms have progressively worsened over the past 2 to 3 days. The pain is diffuse and comes in waves. He denies fever or chills, but has a history of constipation. He reports no flatus for 24 hours. Physical examination is notable for diffuse tenderness and voluntary guarding. There is no rebound tenderness. An abdominal radiograph is seen below. Which of the following is the most likely diagnosis? 6. A 23-year-old woman presents to your clinic with RLQ pain for the last 1 to 2 days. The pain is associated with nausea, vomiting, diarrhoea, anorexia, and a fever of 38.30C. She also reports dysuria. The patient returned one month ago from a trip to Mexico. She is sexually active with one partner but does not use contraception. She denies vaginal bleeding or discharge. Her last menstrual period was approximately 1 month ago. She has a history of pyelonephritis. What are the three priority considerations in the diagnosis of this patient? 7. A 29-year-old man presents to the clinic complaining of RLQ pain for 24 hours. He states that the pain first began as a dull feeling around his umbilicus and slowly migrated to his right side. He has no appetite, is nauseated, and vomited twice. His BP is 130/75 mm Hg, HR is 95 beats per minute, temperature is 38.2oC, and his RR is 16 breaths per minute. As you palpate the LLQ of the patient’s abdomen, he states that his RLQ is painful. What is the name of this sign?